LOC Renewables has reached an agreement to partner with the Taiwanese certification body, CR Classification Society, to offer comprehensive marine warranty surveying services for Taiwanese offshore wind projects. Taiwan recently announced it has awarded contracts for over 3.8GW of new offshore wind projects in an auction process. With the government aiming to phase out nuclear power and derive 20% of the island’s power supply from renewables by 2025, the abundant wind resource in the Taiwan Strait has provided the incentive for international players to enter the fledgling market. Government strategy for expanding the offshore wind energy industry in the country puts an emphasis on the development of local skills and technology throughout the process. Bid-winning developers need to demonstrate a commitment to boosting local expertise in the areas such as engineering design and construction, as well as working with local financing partners. Under the terms of their agreement, LOC Renewables and CR Classification Society will jointly tender to provide MWS services for Taiwan’s offshore wind energy project pipeline. 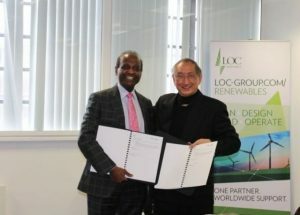 As the Taiwanese offshore wind market gears up, the partnership between LOC and CR will allow developers to satisfy local content requirements and benefit from local experience, while also invoking LOC’s global marine and engineering expertise, honed on generations of European offshore wind projects, to ensure projects meet rigorous marine engineering standards.